Bluwater is new ultra-luxurious condominiums in Oakville. 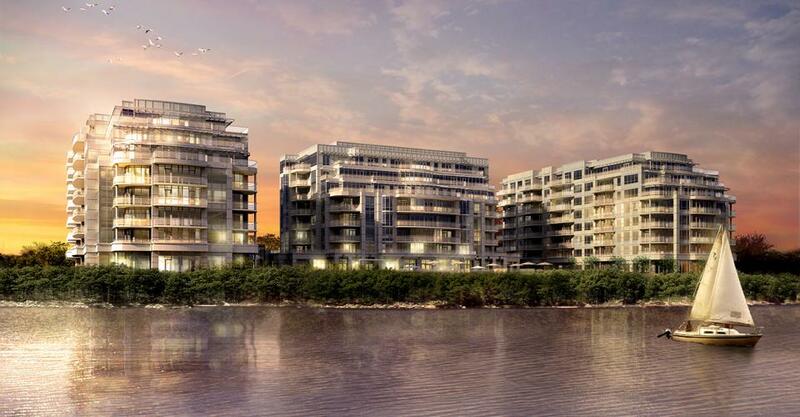 These condominiums are developed along the shores of Lake Ontario by Pemberton Group. There are 204 suites in three eight floor buildings. A pristine lakeside location, innovative lifestyle amenities infused with a philosophy of wellness and a commitment to beautiful, creative surroundings distinguishes Bluwater and sets it apart. With all of the charm and amenities of a 5-star luxury resort, summer months are glorious times at Bluwater. Dine al fresco, sunbathe beside the plunge pool and enjoy the beauty of the magnificent outdoor fireplace. Inside, Bluwater is dedicated to the health and well being of its residents. A fully equipped fitness centre, spa, party room and resident's lounge are beautifully designed and appointed to reflect the ultimate in luxury. Great care and thought has gone into the design of the suites at Bluwater. Beginning with spacious 9' ceiling heights and commanding windows, the suites at Bluwater are nothing less than majestic. Add to this, spacious floorplans that provide exceptional layout opportunities for furniture, and you have tremendously livable space that can accommodate full size luxury living. There are studio, 1 bedroom, 1 bedroom plus den, 2 bedroom, 2 bedroom plus den suites available in these condominiums. Condos range from 355 to 2,685 square feet in size.